(Beyond Pesticides, December 12, 2018) Costa Rica is currently experiencing exponential growth in its banana and pineapple farming industries and with it an increase in intensive pesticide applications. 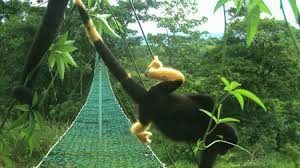 Recent studies in Costa Rica identified evidence of increasing fur discoloration in black mantled howler monkeys ((Alouatta palliata) as a result of their exposure to sulfur-based pesticides. Coloration in Howler monkeys are limited to black, gray, and dark brown, but researchers found several monkeys with yellow patches on their tails and legs. The change in pigmentation is directly correlated to the consumption of plants inadvertently exposed to sulfur-based pesticides sprayed at (and drifting from) nearby farms. The use of pesticides is not only hazardous to nearby wildlife, but communities as well. It is an issue that seems to play out repeatedly both in Costa Rica and in the U.S. The use of pesticides, and more importantly pesticide drift, continues to be a pervasive issue with severe human and environmental health consequences. Pesticide drift occurs in the form of mist, particles, or vapor (gas) and are usually carried by air (and oftentimes water) currents. Typically, fumigants (gaseous pesticides) are most likely to drift. When used, pesticides regularly spread further than the established application site and contaminate surrounding land and waterways through runoff. Leaching of pesticides into waterways result in short-term and long-term detrimental impacts in and around tracks of treated farmland. With continued investment and expansion in these industries, Costa Rica has seen a dramatic increase in the use of pesticides and other agrochemicals. Costa Rica is revered ecologically with over 52 percent forest cover and has one of the highest biodiversity densities in the world. It also has well established banana and pineapple industries that account for approximately $2 billion of its US $57.44 billion GDP that heavily employs agrochemicals in attempting to enhance growth and crop yield. Banana and pineapple farming are intensely managed agroecosystems with high inputs of synthetic chemicals, generally in the form of pesticides and fertilizers. Exposure to excessive amounts of agrochemicals often results in internal and external damage to organisms exposed. Melanogensis, for example, is the process of providing pigmentation in animals and humans and when exposed to pesticides can cause in an alternation in the melanin from eumelanin (darker pigmentation) to pheomelanin (lighter pigmentation, i.e. yellow, red, or orange tones). In addition to altered pigmentation, excessive exposure often results in sensitivity to light, skin irritation and cancer. In addition to pigmentation bleaching, the use of pesticides in this region have adversely impacted surrounding communities resulting in increased incidences of epithelial damage, gastrointestinal issues, nervous system disorders, eye irritations and birth defects. Costa Rica is not alone in its struggle to prevent adverse impacts associated with pesticide drift and the adverse side effects of exposure. Since pesticide drift is an unintended consequence of pesticide application, limiting or preventing drift falls solely on standards put in place by federal, state, and/or local governments. For the most part, current regulations in the U.S. have proved inadequate to prevent drift, but there are those attempting to move in the right direction. California, for example, is noted to have historical environmental justice concerns surrounding failures to prioritize community health over industry profits, while simultaneously having strict standards limiting applications to minimize drift on the books. Other areas, like Iowa, are having a difficult time gaining the support needed to pass protective measures. Pesticide drift is a pervasive issue impacting communities surrounding intensive farming operations. The production of many cash crops, like pineapples and bananas, adversely impact human and environmental health. Supporting the use of alternative practices such as polyculture rather than monoculture; mulching around the base of the plant, animal integration and other organic practices can assist eliminate the need for pesticides and therefore the likelihood of pesticide drift. This entry was posted on Wednesday, December 12th, 2018 at 12:00 am	and is filed under Agriculture, Pesticide Drift, Sulfur, Uncategorized. You can follow any responses to this entry through the RSS 2.0 feed. You can skip to the end and leave a response. Pinging is currently not allowed.